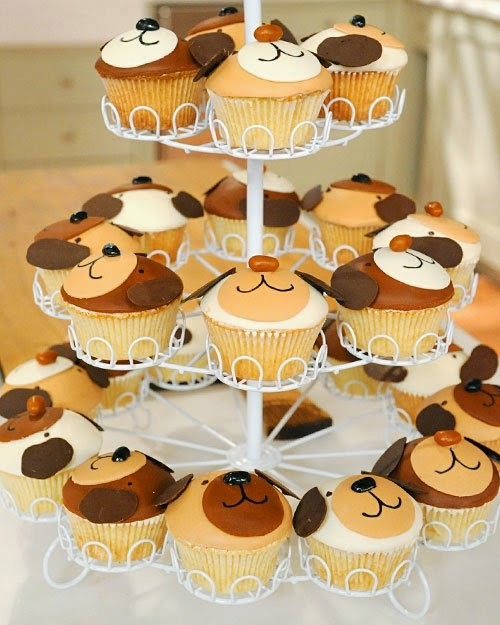 Kids will fall head over "paw" for these adorable puppy cupcakes from Cake Power founder Kate Sullivan. Download and print the dog-ear template for a handy decorating guide. Preheat oven to 325 degrees. Line two 12-cup standard-size muffin pans with cupcake liners; set aside. Sift together flour, baking powder, baking soda, and salt. In the bowl of an electric mixer fitted with the paddle attachment, cream together butter and 2 1/4 cups sugar until fluffy. Add eggs, one at a time, beating well after each addition; stir in vanilla. Add flour mixture to egg mixture in three additions, alternating with sour cream, beginning and ending with flour mixture. Fill prepared muffin cups with 1/4 cup batter each. Sprinkle remaining 1/4 cup sugar evenly over tops of cupcakes. Transfer to oven and bake until a cake tester inserted into the center of a cupcake comes out clean, about 30 minutes. Let cupcakes cool in pans for 10 minutes before transferring to a wire rack before cooling completely. Transfer cooled cupcakes to refrigerator; let chill for 10 minutes. Place 2 tablespoons frosting on each cupcake; smooth into a dome-shape on top of each cupcake. Knead enough gel-paste food coloring into 1 1/2 to 2 pounds of fondant to create desired shade of brown. Lightly dust work surface with cornstarch and roll out fondant. Using a 3-inch round cutter, cut out 24 circles and transfer to a baking sheet; transfer baking sheet to refrigerator and let chill for 5 minutes. Lightly dust work surface with cornstarch and roll out remaining 1 1/2 to 2 pounds fondant. Using a 1 3/4-inch round cutter, cut out 24 circles and transfer to a baking sheet; transfer baking sheet to refrigerator and let chill for 5 minutes. Place a 3-inch brown circle of fondant over the top of each cupcake, smoothing with hands. Brush 1 1/2-inch white circles with water; place on top of brown circles, moistened-side down, near the bottom of each cupcake to create the muzzle. Set cupcakes aside. Place dog ear template on a baking sheet and cover with a sheet of waxpaper. Place melted chocolate melts in a resealable plastic bag; snip corner of bag to create a small (about 1/8-inch) hole. Trace ear shapes from template onto wax paper with melted chocolate; fill in ears with melted chocolate to cover. Transfer to refrigerator until hardened, about 5 minutes. Using remaining melted chocolate, pipe dots onto each cupcake to create eyes. Use melted chocolate to adhere Sugar Babies or jelly beans to cupcakes to create a nose. Remove chocolate ears from wax paper; use melted chocolate to adhere to cupcakes. Using edible-ink marker, draw a mouth onto each puppy cupcake. Serve.